But a few weeks ago Billy Abbot, Richard Barr and I were having a “passionate” chat about the qualities of Jim Murray as whisky taster and his Liquid Gold Award ( and 96.5 score ) for Johnnie Walker Black Label, yep, that very same whisky. At first we were just talking about if the score was good or it was bad ( and I think that it is crazy ). I reckon that I usually score whiskies between 85-93 with very few bottles outside that range as I explain here. Personally I think a score-less review is like a way of cheating you, the reader of this blog, of saying that I am not sure that I want to say the whisky is bad because I will lose something ( free samples anyone?! ). I can understand that there are people out there that don’t score whiskies. Perfect. But in whatever way you do, you must mentally sort your whiskies… with a number, with a color, with stars… but it is hard ( for me ) to believe that a bad whisky and a good whisky can live one next to the other. Particularly, I bought a bottle of this Coca liqueur a few years ago because it was really curious. Just keep in mind that coca leaf isn’t cocaine. Also it looks like that the coca leaf used on this beverage has had their psycotropic components removed. Booooo! Agwa de Bolivia, which is considered to be the world's first and only spirit derived from coca leaf. The translucent green liqueur is delicious and needs little else but some fresh lime juice and a couple of ice cubes, if you prefer it chilled (see the gallery below for cocktail recipes featuring AGWA de Bolivia). AGWA contains guarana, an extract from the seeds of Paullina Cupana (which contains caffeine); ginseng (a stimulant); and approximately 40 grams of coca leaf in every bottle. Nose (75): more than average. green, agave, citrus. Like a white Tequila... not bad. Palate (77): light, smooth. honey, floral, agave, sugar. Finish (76): short. sugar, citrus. So based on other whiskies I have already tasted I rate this Agwa de Bolivia Coca Leaf Liqueur with 76 points over 100. Not sure I would recommend you this. I really go and get a proper Tequila and add some sugar to it… pretty much the same experience. With much less hype on the other hand. Palate (69): powerful, oily. anise, floral, sugar. Finish (69): long. anise, herbal. So based on other whiskies I have already tasted I rate this Le Diable Rouge with 69 points over 100. Nose (67): average. citrus, herbs, alcohol, anise. Palate (69): powerful, oily. anise, citrus, herbs, sugar, liquorice. So based on other whiskies I have already tasted I rate this Les Diable Vert with 68 points over 100. Palate (70): powerful, oily. anise, herbs, citrus, liquorice, sugar. Finish (68): very long. anise. So based on other whiskies I have already tasted I rate this Le Diable Bleu with 68 points over 100. I dunno if it is because of the absinthe or because of the alcohol but I don’t feel right. 70cl / 68% - An authentic'verte' Swiss absinthe made using 12 plants including angelica & grande wormwood. They, controversially, use grande wormwood in the post distillation maceration, giving a vivid natural green colour and a digestif bitterness. Nose (69): more than average. anise, herbs, sugar, citrus. Palate (75): powerful, oily. anise, herbs, citrus, sugar, liquorice. Finish (72): longer than average. anise. herbs. So based on other whiskies I have already tasted I rate this Angelique Verte Suisse Absinthe with 72 points over 100. 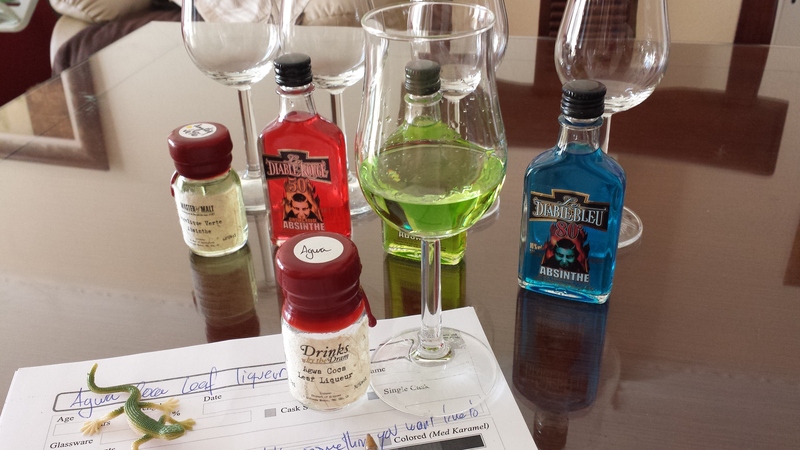 Well… you can’t say I didn’t try it but really I don’t like Absinthe. I find the alcohol content too aggressive, even dangerous. And overall too much anise. In Spain it is very typical to drink Anis del Mono straight or with a bit of water. It is sweeter and with even more anise that absinthe… and well, it isn’t neither my kind of drink.